Russian forces crossed the border to the Savo area on the 28th of February, about one week after the main forces in the south. The 5th Division of Lieutenant-General Nikolai Aleksejevits Tutskov started operations with 3.000 men with rest of the division still marching to the area of operations. Finnish force in the area was the Savo Brigade under Colonel Count Johan Cronstedt with 4.000 men. 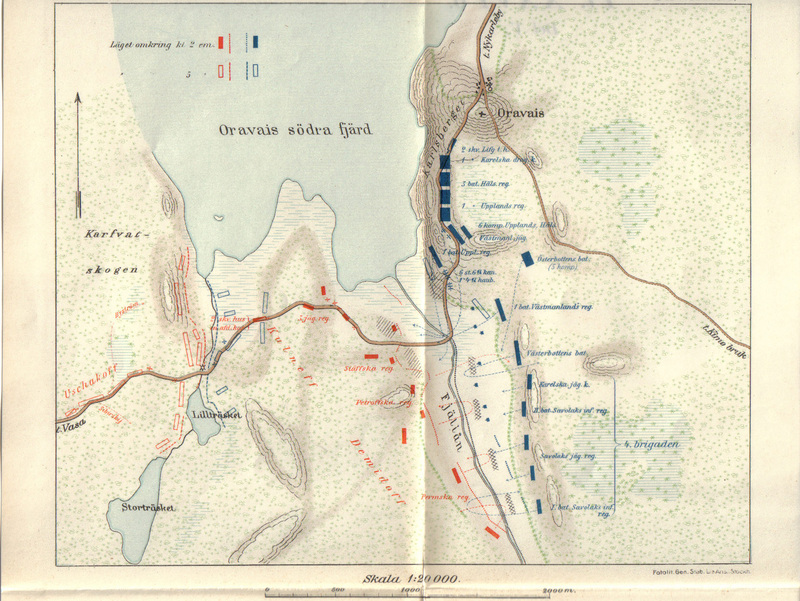 The Savo Brigade was concentrated at Mikkeli with strong detachments to the east. However, based on false intelligence, Finnish forces had already started retreating northwards in order to protect their supply lines from alleged Russian flanking maneuver. With new orders to avoid pitched battles from army commander Klingspor, Savo Brigade moved to Leppävirta south of Kuopio. In the morning of 11th of March Colonel Cronstedt received reports that the Russian force of under 2.000 men was closing in from the south. Finnish forces deployed on the frozen lake. Infantry supported by artillery formed a single line with small cavalry formations on the flanks. In the forests east and west of the lake were detachments of jaegers. The eastern shore has plenty of steepish cliffs which are several meters high. This makes it impassable to formed infantry and cavalry. Russians arrived sooner than expected and started to deploy opposite the Finnish line. 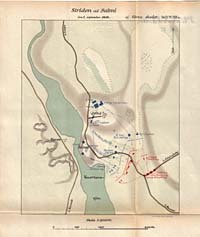 The “battle” turned out to be only a minor skirmish, with two forces exchanging some scattered artillery and musket fire during the afternoon and cossack attempts to threaten Finnish flanks easily repulsed by Finnish salvos. Under the cover of night Finnish forces, according to the orders, continued their withdrawal north towards Kuopio. Apparently the Russians were somewhat hesitant to advance since their right flank in the east hadn’t frozen due to strong current. It is said that because of this several battalion commanders pleaded Cronstedt to crush the Russians with a flanking maneuver from west/behind. If all the troops of the III (Savo-Karelian) brigade that were present (some weren’t deployed) had been committed to this attack, their numbers would also have been superior to the Russians. It was already early summer when Finnish army under Klingsporg finally started its counteroffensive to the south. With many smaller skirmishes the Finnish army pushed slowly Russians southwards. On 8th of July, small detachment from Finnish army reached the village of Lapua. 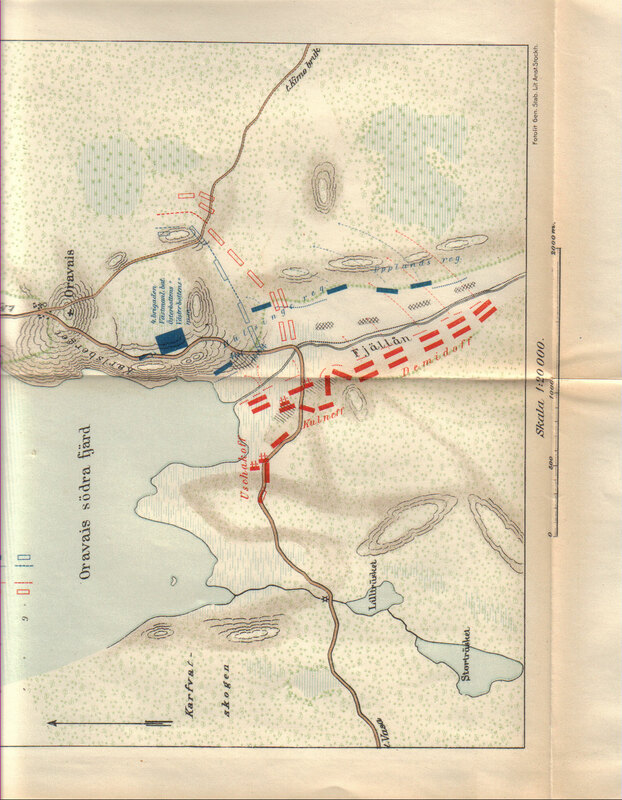 As soon as the the russian general Rajewski realised how small these forces were he quickly pushed them back and concentrated about 6000 men to control the important east-west road in the area. The commander of the main body of Finnish army, general Adlercreutz also realised the importance of this village. 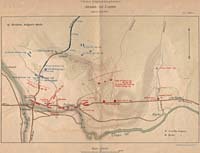 After receiving freedom to conduct operations against Russian in the area as he saw fit, he immediately started to move south towards Lapua on the 14.7. Russian however deployed many light troops to oppose the advance and it took almost all day to push trough to the forested area north of Lapua. After 10 hours the army finally reached the edge of the forest and the battle of Lapua could really start. It was 4pm. The Russian forces had been deployed along the main road in a quite weak line. They had couple of battalions in Suurkylä and Liuhtari, the two main villages, while rest of the force were in the forested area to the east. Behind his main positions was the Lapua river. Communications and supply were to the east along the main road. Finnish army deployed directly from march column by brigades almost as soon as they arrived. The situation gave to Adlercreutz a possibility to try and attack eastern flank of Russian army and severe their communications. He choose more direct approach and decided to attack towards the Suurkylä, with only weak secondary attack on the east. The 2nd Brigade deployed opposite of Suurkylä and started to receive fire from Russian jaegers hiding in the fields. But almost as soon as they had started their advance, the commander of the 2nd Brigade, v. Döbeln was ordered to stop and wait for supporting brigade to move to his right flank. This brigade was deployed based on false belief that Russians had more troops in the west. Russian jaegers continued to cause casualties to the stopped 2nd brigade. 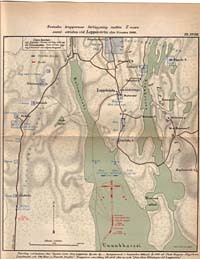 In order to avoid further casualties from continued fire from Russian jaegers and under strong pressure from his frontline officers, Döblen decided on his own initiative to attack Suurkylä. He ordered the 2nd Brigade to charge. 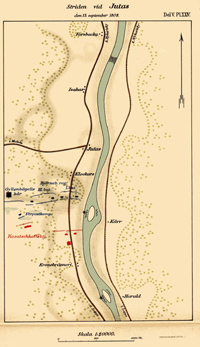 In one quick rush the 2nd Brigade took the village and forced the Russian forces to retreat eastwards along the river. However the Russian move not just a hasty retreat, it was well controlled withdrawal. Rajewski supported his right flank in the forest with his reserve battalions and protected his communictions. At the same time his left flank withdrew first to the Village of Liuhtari and the eastward along the main road. During this withdrawal some buildings in Liuhtari caught fire and some Russian wounded perished. With his right flank well protected, general Rajewski easily left the battlefield with his force more or less intact. Total losses for Russian were 200-400 men and few dozen prisoners, while Finnish army lost about 100 men. 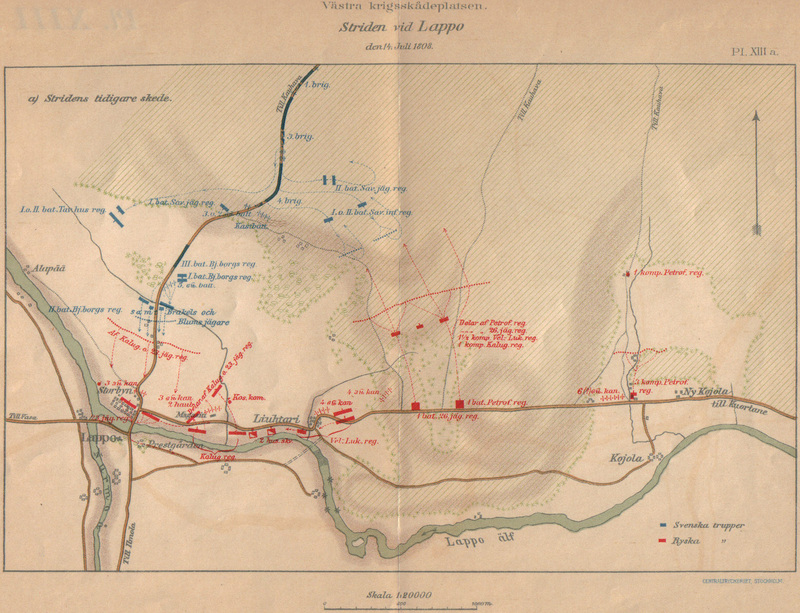 Finnish army considered the Battle of Lapua a major victory, while Russians barely mention this as minor skirmish. After their victory at Lapua, Finnish army continued slowly to push southwards. They won some skirmishes and lost some. While these moves were still not critical to Russians, they had to do something. Commander of Russian forces in Finland, general Buxhöwden decided to appoint a new commader for Russian forced in central Finland. He chose general-lieutenat Count Kamenski and ordered him with his own initiative to aggressively regain lost areas and destroy the enemy. At the same time Russians received two new divisions and more troops to divisions already in country as reinforcements. It was 14th of August when General Kamenski started his offensive. After few smaller engagements, he arrived with his main force of about 9000 men to village of Ruona which was defended by little over 5000 men of Finnish army. It was a good defensive position and general Adlercreutz commanding this main body of Finnish army had prepared the positions with artillery redoubts and other entrenchements. Russian force attacked these positions on 1st of Septmeber 1808. The Finnish forces had beed deployed behind a small stream and a minor lake. In the south defences were manned by the 4th Brigade, who had burned the main road bridge just last night when Russian forward detachment arrived. North of the small lake was the 1st Brigade and on the northern flank the 4th Brigade. Russian forces were coming from the south and they were only deployed few batteries to oppose the Finnish southern flank. General Kameski decided only to demostrate against southern positions, and ordered Gerenal Rajewski to move trough forest in the east and try to find and attack the northern flank of Finnish positions. He had 8 battalions and 2 artillery pieces that had to be dismantled to be moved through a very difficult ground. Russian were also awaiting reinforcements from northeast to support this effot, but they never arrived. Finnish forces and General Adlercreutz noticed this move and send reinforcements to the north. 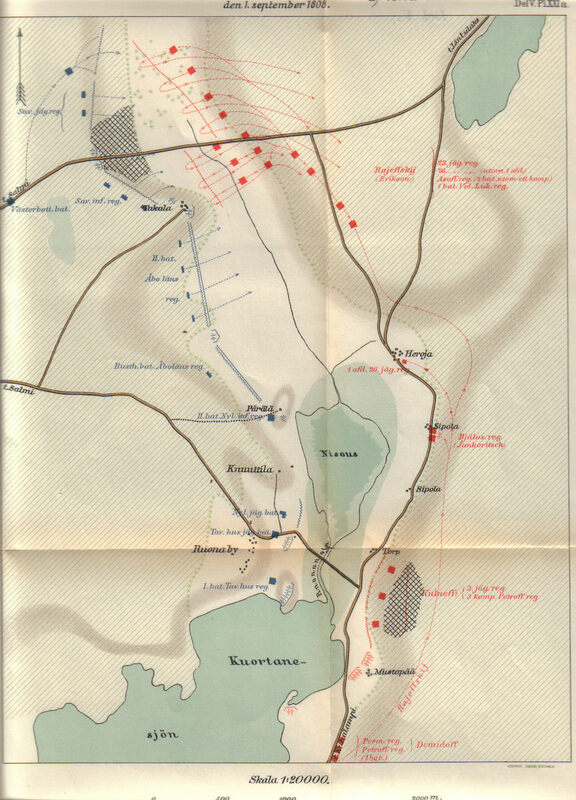 With their strong defensive positions, the Finnish army easily repulsed the Russian attack that instead of flank hit straight to the prepared positions of 4th Brigade. 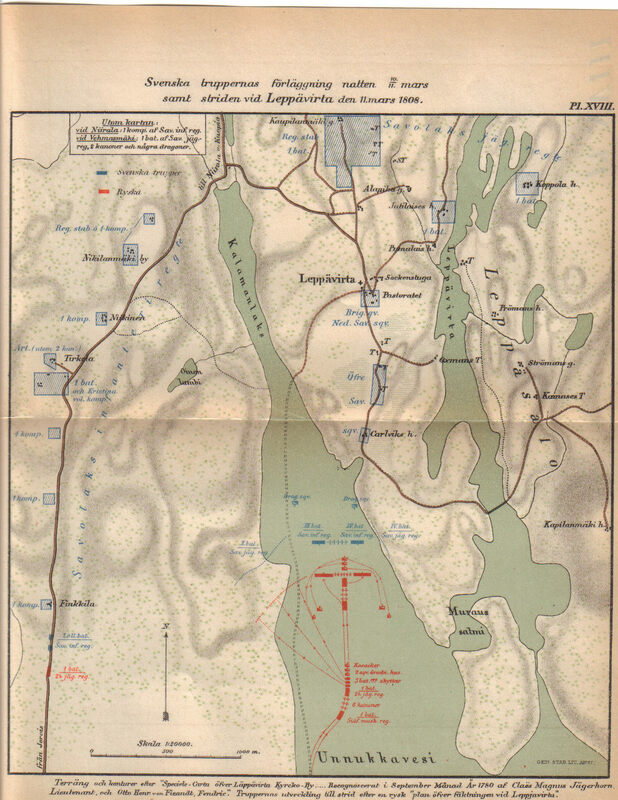 With this attack repulsed, Finnish army launched a counterattack north of the small lake and quickly reached the small villages of Heroja and Sipola. Here the Russian forces supported by those two cannons managed to stop the counterattack. They were even supported by some cavalry that manged to rush north along the road in front of Finnish batteries. Night fall ended the fighting, for what looked more or less a stalemate, and such could be counted as Finnish defensive victory. During the evening general Kamenski decided that the enemy positions were just too strong and orderd the army to start retrearing southwards in the morning. During the night things changed. Russian colonel Kulnew noticed when checking his guards that Finnish army was making a move. It soon came evident that they were not preparing for night attack, but starting to retreat west. 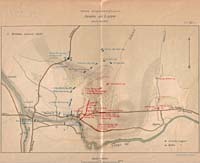 General Adlercreutz had decided that Russian detachements maneuvering on his flanks were too dangerous and there was a danger of encirclement. General Kamenski changed order for retreat for order for pursuit. After few kilometers the retreating Finnish army stopped at village of Salmi. General Adlercreutz decided to make stand here along the ridge going north from village of Salmi. The postion was good, but not nearly as strong as the positions left at Ruona. 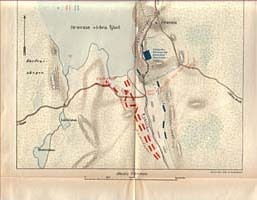 Russian forces came in hot pursuit, lead by cavalry and light troops. However, the burned bridge at Ruona slowed the movement and there was only the forward detachement under colonel Kulnev and few other troops. Colonel Kulnev decided to act aggressively as he assumed this to be only a rearguard action. He send his jaegers to skirmish with Finnish counterparts and started to prepare an assault on his left to clear up finnish forward positions. Russians gained an upperhand on the battle of skirmishes and pushed the Finnish forces back to their main lines. However these positions were so strong that Kulnev decide that he couldn’t possibly take them with forces at hand. 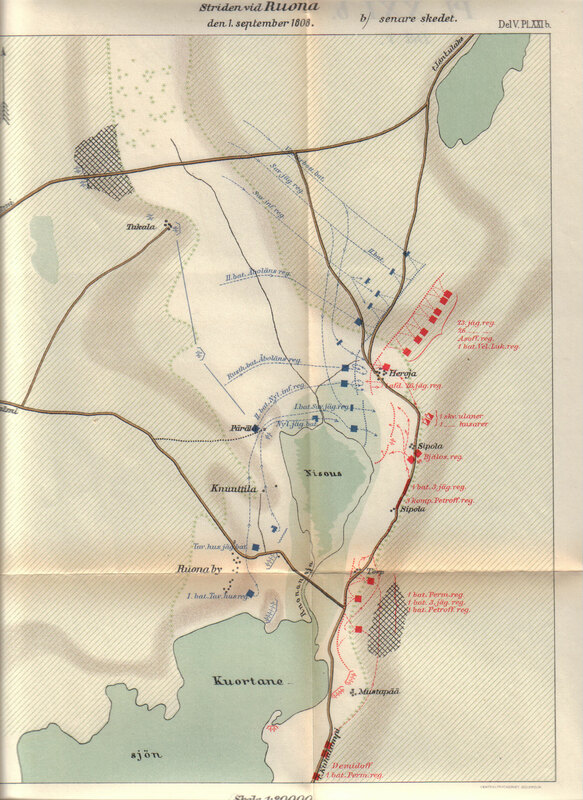 To continue the pressure Kulnev started to prepare for a flank attack against norther end of the Finnish line. These preparations and redeployment of his few reserve battalions took over two hours. During this time battle paused and troops had time to rest a little. Russians restarted the battle with strong offensive against Finnish left flank as planned. Fighting in the forest lasted for three hours without either side gaining a decive advantage. Battle could have continued for much longer, but at this time general Adlercreutz received orders from commander-in-chief general Klingspor that he must continue the retreat westwards. General Klingspor had received more reports on those Russian forces on the flanks of the main Finnish army. He decided that the threath of encirclement was still too strong and ordered the army to retreat. Adlercreutz had no choice, but to follow the order and the Finnish army retreated again undefeated. This time the Russian forces were spent and could only make a token pursuit for few kilometers. During these two days both sides had lost about 1000 men. This retreat effectively ended the Swedish counteroffensive and the Finnish army would not comes south again. After the failure of the summer counteroffensive and defeats in Battles like Ruona and Salmi, the Finnish army started its second and final retreat north. First there were plans to move the army, wounded, prisoners and the stores over the sea to Sweden from Vaasa, but this came to nothing. There just wasn’t enough ships to move the whole force. On the 11th September Council of war decided to march the army to Oulu along the coastal road. The army started moving north the same day. Road were filled up with troops and all the belongings of a retreating army. And the Russians didn’t just settle to follow along the road. Using secondary roads connecting to the coastal road from east and their started to threaten Finnish flank. Along the Lapua river was one of these secondary roads that met the coastal road near Juutas. Unit guarding this crossroads retreated north on the 12th September, leaving only a small detachment. The Russians under Colonel Kozatskovski with 2.000 men were closing form the east. The danger was noticed and Finnish army ordered 2nd Brigade to move troops to the area. With the retreating columns was Colonel von Döbeln, who was recovering from earlier illness. He also realized the danger and hurried to the crossroads. In the early hours of the 13th September von Döbeln met and took command of the troops of the 2nd Brigade, his old command. He ordered a forced march to the Juutas crossroads and arrived there in the morning just in time. The Russian advance guard was already in sight. Colonel von Döbeln deployed two battalions of the Pori regiment supported by two 6 pounder guns along the road to east. His flanks were protected in the south by Gyllenbögles Fricorps and north by the Lapua river. Total forces were about 1.200 men. It seems that Colonel Kozatskovski didn’t expect any real resistance and decided to attack along the road with three battalions totaling about 1.500 men. The attack started in the afternoon around 15:00. 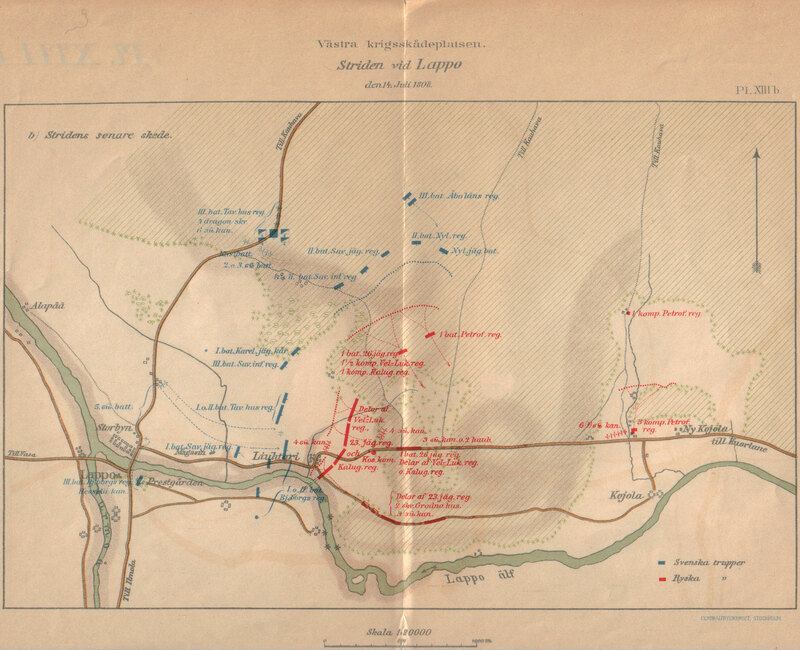 Russians attacking along the road were met with volley and canister from von Döbelns forces. The assault turned quickly into a long desultory firefight. All flanking attempts trough the forest in the south was also repulsed by Gyllebögels men. As the evening arrived Russian forces had been defeated and were retreating rapidly all the way to the Alahärmä. Despite with its reputation in Finland, Battle of Juutas was more like a skirmish. Even if victorious Kozatskovskis brigade shouldn’t have been a major obstacle for much larger Finnish forces moving along the coastal road. While Colonel von Döbeln was winning his famous victory at Juutas, the main Finnish army arrived at Oravainen. Army had marched north along the coastal roads only for few days, but there was no sign that the Russians would just let them go. Cossacks harassed the rearguards and as seen at Juutas they also tried to outflank the retreating army in anyway possible. In order to keep the army moving, General Adlercreutz ordered to abandon all damaged wagons and it seemed that the Finnish army was really trying to break clean form pursuing Russians. But on the 13th of September Finnish army arrived at Oravainen and started to build defensive works on the very next day. Even with threats to his line of communications, General Adelrcreutz had decided to engage pursuing Russians. With his army somewhat better concentrated and constant demands from the king to fight, General Adlercreutz probably decided that he could inflict enough damage to discourage Russian from too close pursuit of his army. He had also been reinforced by Swedish division under Generalmajor von Vegesack. Generalmajor Gripenbergs 3rd Brigade was already on the march north. Gripbenberg would be absent from Oravainen, and would be too late for Juutas. The rest of the Finnish army deployed for defense just south of Church of Oravainen. The Finnish army deployed behind a small stream along a forested high ground. It was a good position where the main force near the road was supported by artillery with commanding fields of fire. 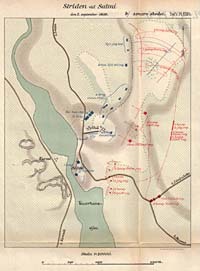 Defensive line continued south in a single line of battalions, with the light troops of the 4th Brigade holding the flank. The main position was covered by a small outpost of Swedish troops under Colonel von Platen, with 7 companies and pair of 6 pounders. The Russian army advanced in three detachments of brigade strength. First to arrive were the four battalions of Colonel Kulnev. He attacked at dawn. 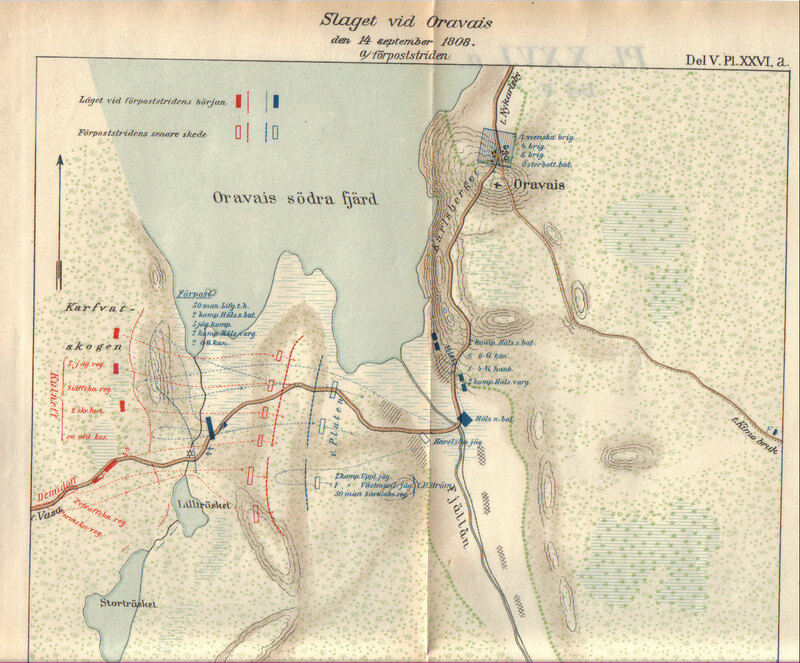 Swedish troops of the outpost put up a stiff resistance and after receiving some reinforcements they even started to push back superior numbers of Russians. Situation changed as the next detachment of Russians arrived under Generalmajor Demidov. New Russian battalions forced the Finnish to retreat. 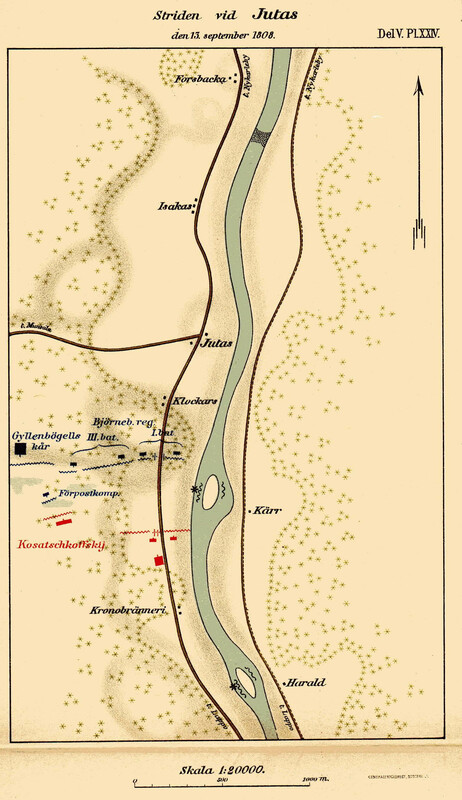 The outpost commander Colonel von Platen and heroic young artillery lieutenant von Schwerin were wounded, but they managed to pull back most of their troops to the main lines. During the fight for the outpost, General Adlercreutz had time finish his deployments and his positions were strong. Just before noon the Russians finished their deployment for attack. Colonel Kulnev started the attack on the left and was soon followed by Generalmajor Demidov on the right. 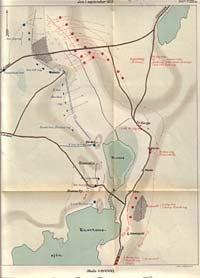 Both attacks failed in the face of prepared positions and some Finnish army battalions even made localized counterattacks. Russian forces reformed and tried again around 14:00. Again the weaker they were repulsed easily and this time General Adlercreutz ordered more coordinated counterattack. He ordered Colonel Brändström with several Swedish battalions to attack along the road. The attack was met by weakened Russians, and their artillery had its first good targets of the day. But even with artillery inflicting serious damage to attacking battalions, they could stop Colonel Brändströms battalions. All Russian forces started to withdraw, but managed to avoid being routed. The Finnish forces were elated and pursued sensing a victory. General Adlercreutz was happy with the apparent victory and rode to the front. 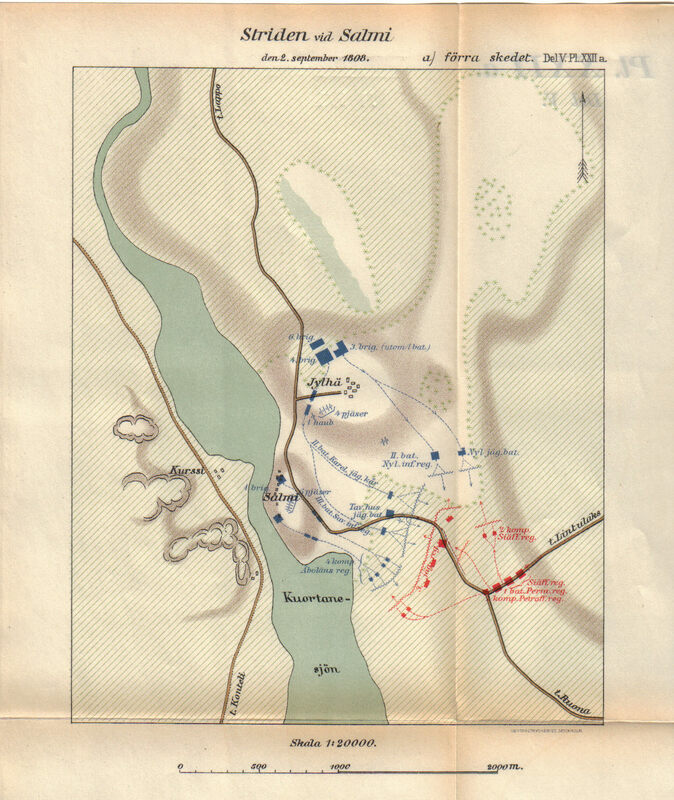 Unfortunately he found Colonel Brändström who had been badly wounded and lost the control of his forces as they continued the disorganized pursuit all the way to the site of early morning outpost battle. Then arrived the overall commander of Russian forces, General Kamenski. Kameski refused to admit that the battle was lost, and send several couriers to the commander of the third detachments Generalmajor Usakov with orders to hurry up. Even as most Russian commanders believed the battle lost, Kamenski managed to hold on long enough for the Usakov to arrive. With these strong reinforcements Russians threw back Finnish forces with heavy losses. Soon they were back at the original defensive positions. General Kamenski reformed his forces, redeployed and prepared to attack again. He ordered General Demidov to hit the Finnish southern flank again. And even as the night was fast approaching, this new Russian attack pushed Finnish southern flank northwards. Fighting continued into the night with bayonet attacks and savage close combats in the dark forest. When General Demidov threatened to outflank his forces General Adlercreutz decided to retreat. In the darkness of the night Finnish army retreated disorganized. The Exhausted Russians couldn’t offer any aggressive pursuit. This long 15 hour battle inflicted heavy casualties. Russian army lost 900 men and Finnish army more than 700. Some Finnish army officers still suggested aggressive operations, but war was effectively over. Russian commander General Buxhoevden approached General Klingspor with a ceasefire proposal on 26th September. The ceasefire agreement was signed on the 29th. 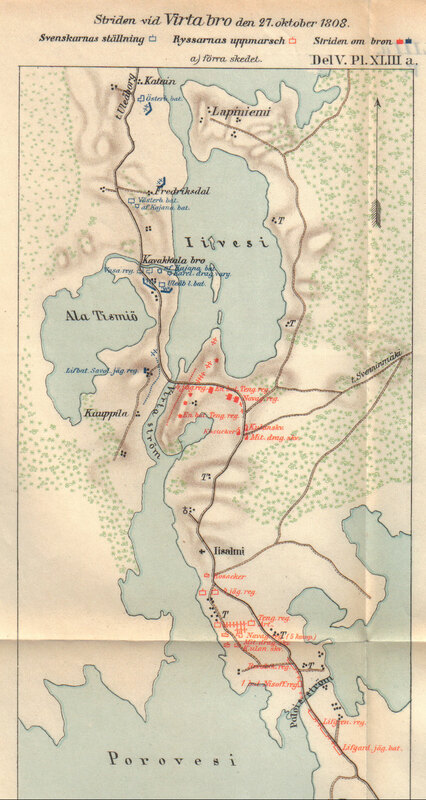 The ceasefire line was agreed on Kokkola – Iisalmi line. The agreement was favorable to Russians as Finnish forces had to retreat north to this line. Both armies got time to rest and reorganize, but this was only a short ceasefire, not peace. In the east, Finnish army had to retreat from prepared defensive positions at Paloisvirta and start new works at Koljonvirta. There was some confusion of exact time the ceasefire was supposed to end and the Russians managed to at least partly surprise the Finnish defenders and the Finns hadn’t had time to dismantle the bridge properly as they were hoping that the ceasefire would be continued. The attack started at 12:00 on the 27th October. Colonel Sandels had in his positions at Koljonvirta about 2.300 men and 14 guns. Main position was at the hill of Linna farm northwest of Koljonvirta, and was fortified with several batteries and supported by infantry in reverse slope. Strong units including almost a 1.000 men were deployed northwards to protect against possible attacks over the lake from the east. The Koljonvirta bridge was guarded by battalion of jaegers and couple of guns. Russian force under General Tutskov was far superior, with about 6.000 men and over 20 guns. Problem was that there was not enough room to use superior numbers against Finnish positions. First there was the only one bridge across Koljonvirta river and later any attack against Finnish main position was up hill along quite narrow isthmus. Supported by a strong battery Russian jaegers attacked the partly demolished bridge defended by one Savo jaeger half battalion and a 3 pounder battery. 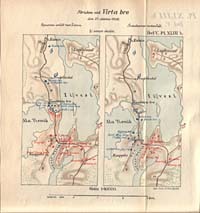 The Finnish managed only to harass Russian attack, and by 15:00 at least four battalions had crossed. Faced with superior numbers Savo jaegers retreated to the main position at Linna farm. 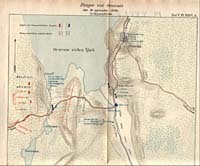 Russians crossed more troops over Koljonvirta and soon had two brigades on the western side. Artillery stayed on the east side of the river, but could bombard at least with some effect the Finnish main positions from there. Quickly many buildings in Linna farm very on fire. Russian attack against the Linna farm started soon after 16:00. The attacking force was one brigade of jaegers and infantry, while the second brigade protected the western flank and provided some support with musket fire over the lake west of Linna farm. 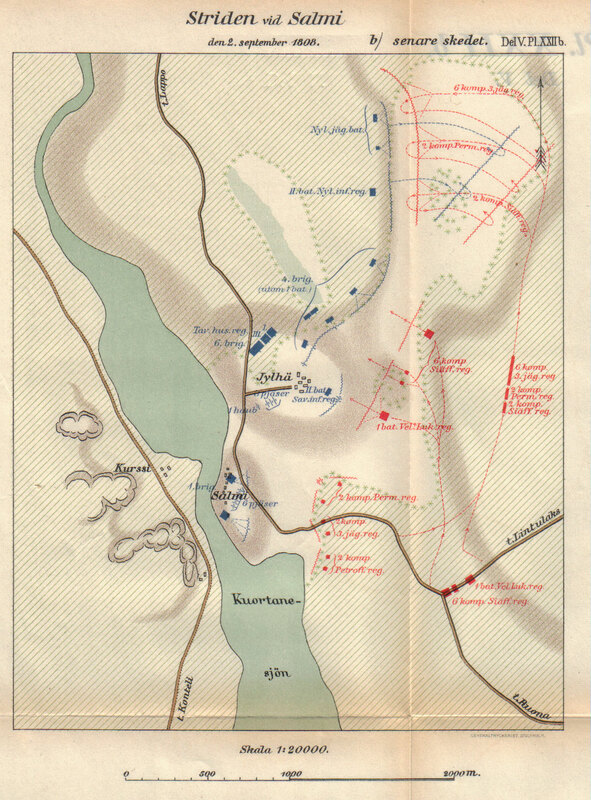 Russian attack managed to reach the Finnish batteries, even against canister fire of the defending artillery. Behind the batteries Savo jaegers had joined the main infantry forces and were preparing for a counterattack. 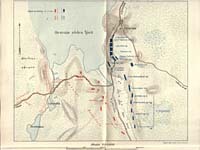 Finnish forces fired a furious volley against Russians and immediately charged in with bayonets. During their advance up slope, Russians had already suffered casualties and been disordered by the artillery. This sudden attack turned the hesitation to panic and the whole brigade started running back towards the river. The other Russian brigade on the west side of Koljonvirta river might very well have been able to stabilize the situation by attacking or even standing firm. But they were taken up with the general panic and also retreated towards the river. The two Russian brigades routed over the Koljonvirta river and countless men were killed trying to swim across or rush over the crowded bridge by Finnish battalion volleys. 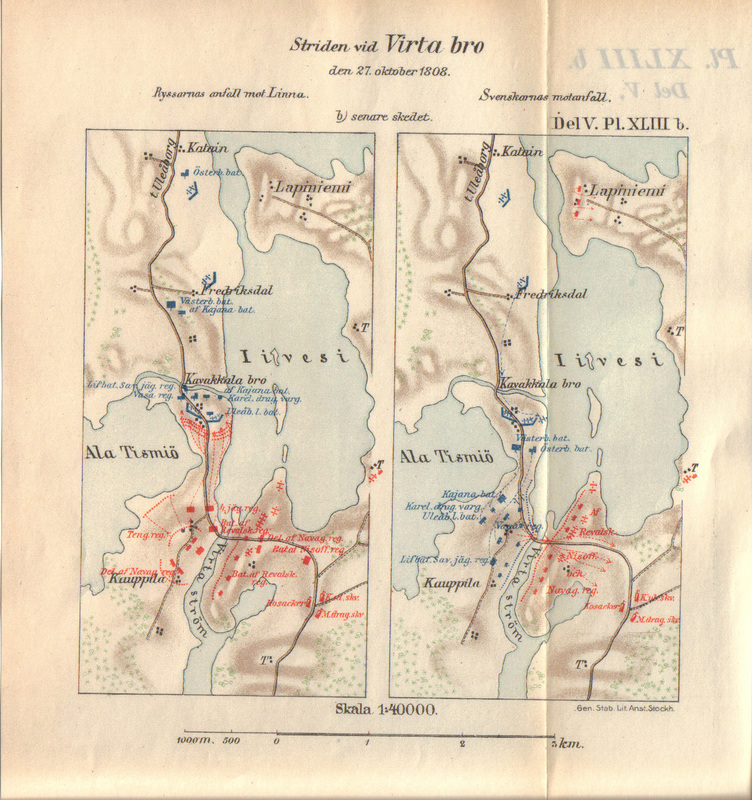 Both forces settled down to a firefight over the Koljonvirta river. Sunset at 19:00 hour ended serious fighting. Russians lost in dead and wounded over 700 men, including many officers. Also the commander General Tutskov was wounded as well as commander of the attacking forces Lieutenant General Prince Dolgoruki being shot to death by Finnish artillery. Finnish casualties were about 300 men. Battle was followed by a 36 hour ceasefire, in order to take care of the wounded and dead. Before the end of this time Colonel Sandels ordered the retreat northwards to Vieremä, leaving only a small rearguard.